The essential guide for your writing career is here! The Business of Being a Writer by Jane Friedman (@JaneFriedman), recently released by The University of Chicago Press, delivers comprehensive insight from my favorite thought leader about successfully navigating today’s publishing landscape. About a decade ago in her role as editor at Writer’s Digest Books, Jane acquired my first creative companion Writing the Life Poetic. Since that time, her panoramic writing and publishing expertise (shared on her award-winning website, as a columnist with Publishers Weekly, and as co-founder of The Hot Sheet, among others) has continuously helped me break new ground in my writing life. In her new book, Jane offers an in-depth education about what it takes to make a life and a living as a writer. Check it out in the following guest post excerpted from The Business of Being a Writer by Jane Friedman. A reliable way to upset a roomful of writers is to promote the idea of “brand building.” Unless you are already comfortable with the idea of running your writing career like a business, it goes against literary sensibilities to embrace the idea that you, or your writing, might be boiled down to something so vulgar. It can also feel suffocating—who wants to feel beholden to their “brand”? I use the word “brand” to indicate strategic awareness about what type of work one is producing, how and where that work is being seen, and who is seeing it. Brand is about how you and your work are perceived. In a word, brand is expectation. What do readers expect from you? Like it or not, they will form expectations. You can wait and let it happen by accident, but it’s better to consider how you can shape expectations yourself—or decide when and how to work against them. • What do you care about and why? Deceptively simple questions! Some people spend the greater part of their lives answering and reanswering them, so don’t expect to solve this puzzle in one night. The truth is, your story (or brand) will evolve over time—it’s never meant to be a static thing. It’s something that grows, it’s organic, and it’s often unpredictable. Another interesting exercise is to come up with a brand statement that gets at the essence of what you do without using external signifiers. For example, creative writing students from selective programs may be tempted to say, “A graduate of [prestigious MFA program] . . .” and lean on that credit to telegraph who or what they are. This is also a common tactic if you’ve worked for well-known publications or won awards. Set those qualifications aside for the moment, and dig deeper: How does your creative work transcend markers of prestige or transient characteristics, such as your current job title? It’s not that you should leave out signifiers (which may be an important part of your identity); rather, this exercise pushes you to think beyond resume accomplishments. Once you have a partial handle on who you are and what you’re about, you can benefit more from connecting with others and talking about others who have a similar why. This helps you build up a network not only of good will but of genuine relationships that will support your writing career. 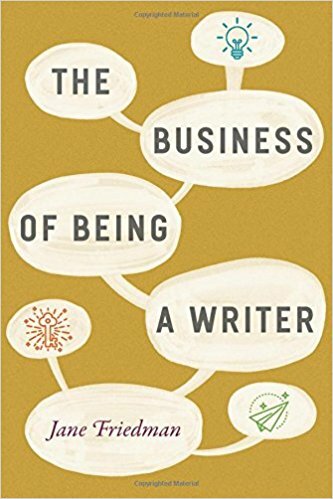 Note from Sage: If you enjoyed this guest post, I suggest that you go get your own copy of The Business of Being a Writer by Jane Friedman (@JaneFriedman) right now! I believe this is a book that belongs on every writer’s bookshelf. Great article on a very interesting topic. This is very helpful as I’m interested in writing and am exploring my options. I’m very passionate about history (and many other topics) and would like to get started somewhere. I highly recommend the book, Gary! It can really help you get oriented about where to get started, and what to do from there!